In late June, we told you about Canadian Real Estate Wealth magazine’s first ever Investor Forum in Montreal. If you were on the fence about attending the September 7th event, you’d better act fast. Every BuzzBuzzHome reader will get a free 6-month subscription to Canadian Real Estate Wealth if they register by Friday July 26th. Plus you’ll also be able to enjoy the kick off rate (a 20 per cent discount on all ticket purchases!). Just use our “IFBUZZ” promo code and register here. A few new faces have also been added to the line-up of investment experts speaking at the event. John Walsh, a co-founder of the Ottawa Real Estate Investors Organization, is currently a mortgage agent working with Mortgage Alliance. With almost 10 years’ experience in real estate investing, he’s able to provide a unique perspective on property in the nation’s capital as well as Quebec’s largest city. Walsh will be taking part in “The Great Debate,” which will answer the question of whether plexes or condos make better investments. Another new must-see speaker? Jean Lebeau, a Montrealer with decades of business experience. Before devoting himself full-time to real estate, he held several senior management positions in the Canadian telecommunications industry, including a few years as a senior manager of real estate for AT&T. Lebeau joins the forum to talk “Creative Financing for Real Estate Investing.” Using actual case studies and detailing the difficulties encountered by investors, Lebeau will help would-be investors find solutions to financing issues. 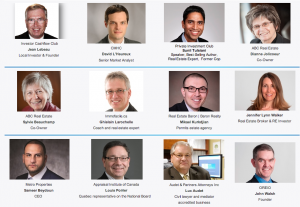 Other speakers include Daniel L’Heureux, Senior Market Analyst at the CMHC, Louis Poirier, Quebec Representative at the Appraisal Institute of Canada, and Sameer Beydoun, the CEO of Metro Properties. We’ll be posting regular updates on the Montreal Investor Forum in the months leading up to the event. Stay tuned for more coverage!